We’d love your help. Let us know what’s wrong with this preview of Tara the Liberator by Thubten Chodron. 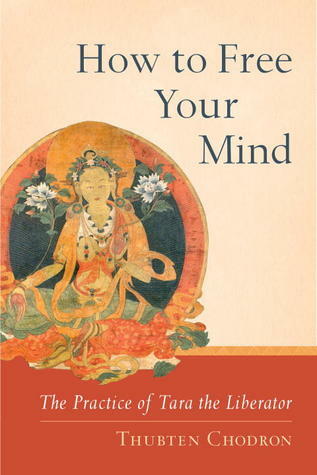 A sharply perceptive introduction to the most popular female deity practice in Tibetan Buddhism, written by a Western practitioner with thirty years experience whose titles have sold well over 100,000 copies. To ask other readers questions about Tara the Liberator, please sign up. The first chapter is spent promising the reader doesn't need to practice buddhism,then by chapter 3 it clearly states that either you do practice buddhism, or you're condemned to perpetual reincarnation. That's exaclty the same as Christians telling that either you believe in their God, or you'r doomed. If there is such thing as THE way for human beings, it must be something that fits anybody. "How to free your mind" by Ven. Thubten Chodron is a gem of a book for those wishing to be introduced in the practice of Tara. It offers an overview of her sadhana (the gelug version), an explanation about the meaning and symbolism of the Praises to the 21 Taras and a lengthy commentary on the beautiful "A song of longing for Tara, the infallible", in which she touches on every important aspect of the path, both from the Sutrayana and the Tantrayana (especially the former), giving an overview of the Lam Rim. Finally, the last 30 pages are devoted to emptiness and dependent arising - though somewhat dense, they are a good summary of what these concepts are, and how they relate to the practice of Tara. Thus, I would recommend this book to anyone interested in practicing Tara, one of the most beloved deities in Tibetan Buddhism, and especially to those embarking for the first time on a short-medium length retreat on her - for them, this is the ideal companion. "How to free your mind" ("Cómo liberar tu mente") por la Ven. Thubten Chodron es una joya de libro para aquellos que quieran introducirse en la práctica de Tara. Ofrece un resumen de su sadhana (la versión gelug), una explicación sobre el significado y el simbolismo de las Alabanzas a las 21 Taras y un largo comentario de la preciosa "Canción de anhelo por Tara, la Infalible", en la que toca todos los aspectos importantes del camino, tanto del Sutrayana como del Tantrayana (especialmente del primero), dando una visión de conjunto del Lam Rim. Finalmente, las 30 últimas páginas están dedicadas a la vacuidad y al origen interdependiente; aunque un tanto densas, son un buen resumen de lo que estos conceptos son, y cómo se relacionan con la práctica de Tara. Like most books of this nature, the opening pages offer promises of enlightenment and claims of radical cures. If that kind of stuff annoys you - steer clear. I'm aware that many of the problems in the world could be solved by changing the way we think (but physical illness requires treatment of the physical cause in order to properly heal). If you know that your problems are caused by negative thinking, then this book could be beneficial as it requires readers to question and re-evaluate their Like most books of this nature, the opening pages offer promises of enlightenment and claims of radical cures. If that kind of stuff annoys you - steer clear. I'm aware that many of the problems in the world could be solved by changing the way we think (but physical illness requires treatment of the physical cause in order to properly heal). If you know that your problems are caused by negative thinking, then this book could be beneficial as it requires readers to question and re-evaluate their thought-processes. I'm eclectic pagan and my education in Hinduism is spotty and, as I am with most religions, I don't care what the general consensus is on the interpretations of the text - I almost always prefer my own. Parts of the book felt new-agey, which may frustrate adept readers of Hindu philosophy. I'm neither an expert at Hinduism nor familiar with Tara, though some of her iconography is similar to Kali. I enjoyed the prayer-mantras scattered through the book and may use them in meditations of Kali. "A Song of Longing for Tara" and "Reflections on A Song" was my favorite part of this book. The book is geared for a general audience and many Buddhist concepts are explained as they are introduced for readers who don't have the cultural background. I expected more parables revolving around Tara; this book was more like an introduction to the Devi. The beloved deity Tara is the feminine embodiment of enlightenment. For centuries practitioners have turned to her for protection from both external and internal dangers, from fire to arrogance. This well-written book presented in conversational style is an authoritative guide to the practice of Tara. It includes very helpful chapters on the whys and hows of various Tara practices as well as a commentary on the "Homage to the Twenty-one Taras." A beautiful offering. These teachings have steadied me in Dharma study. There is so much depth, clarity, and loving-kindness, strength and hope in these teachings and teacher. Thank you, thank you. I am continuing and continuing to read. Ven. Chödrön offers a wonderful discourse on Buddha Tara. As a Westerner I found her descriptions of verses, metaphors and iconology indispensable. Without this book my understanding of Buddha Tara would have been very superficial, so I am thankful to have had this guidance. Did not enjoy this book as much as I thought I would. Thubten Chodron makes even the more complex Buddhist teachings accessible. This book about Tara is written for Buddhist practioners. Anyone can learn from reading it and no one should be dissuaded from reading this, but this is not an introductory book. Born in 1950, Venerable Bhikshuni Thubten Chodron (Ch: 圖丹.卻淮) grew up near Los Angeles. She graduated with a B.A. in History from the University of California at Los Angeles in 1971. After travelling through Europe, North Africa and Asia for one and a half years, she received a teaching credential and went to the University of Southern California to do post-graduate work in Education while working Born in 1950, Venerable Bhikshuni Thubten Chodron (Ch: 圖丹.卻淮) grew up near Los Angeles. She graduated with a B.A. in History from the University of California at Los Angeles in 1971. After travelling through Europe, North Africa and Asia for one and a half years, she received a teaching credential and went to the University of Southern California to do post-graduate work in Education while working as a teacher in the Los Angeles City School System. In 1975, she attended a meditation course given by Ven. Lama Yeshe and Ven. Zopa Rinpoche, and subsequently went to their monastery in Nepal to continue to study and practice Buddha's teachings. In 1977, she received the sramanerika (novice) ordination, and in 1986, received bhikshuni (full) ordination in Taiwan. She studied and practiced Buddhism of the Tibetan tradition for many years in India and Nepal under the guidance of His Holiness the Dalai Lama, Tsenzhap Serkong Rinpoche, Zopa Rinpoche and other Tibetan masters for many years. She directed the spiritual program at Lama Tzong Khapa Institute in Italy for nearly two years, studied three years at Dorje Pamo Monastery in France, and was resident teacher at Amitabha Buddhist Center in Singapore. For ten years she was resident teacher at Dharma Friendship Founation in Seattle, where she continues to be spiritual advisor. Ven. Chodron was a co-organizer of Life as a Western Buddhist Nun, and took part in the conferences of Western Buddhist teachers with H.H. the Dalai Lama in 1993 and 1994. She was present during the Jewish delegation's visit to Dharamsala, India, in 1990, which was the basis for Rodger Kamenetz' The Jew in the Lotus, and attended the Second Gethsemani Encounter in 2002. She is keen on interreligious dialogue. She has also been present at several of the Mind-Life Conferences in which H. H. the Dalai Lama dialogues with Western scientists. Ven. Chodron travels worldwide to teach the Dharma: North America, Latin America, Israel, Singapore, Malaysia, and former communist countries.. Seeing the importance and necessity of a monastery for Westerners training in the Tibetan Buddhist tradition, she founded Sravasti Abbey and is currently involved in developing it.